This Cal Poly QL+ Team was tasked with designing technology that would allow visually impaired kayakers to complete a basic kayak slalom course. The QL+ Challenger for this project is Team River Runner. Team River Runner is an organization dedicated to creating "an environment of healthy adventure, recreation, and camaraderie for healing active duty, veteran service members, and their families through adaptive kayaking.” Team River Runner wants to employ a modified version of a kayak slalom course that would be navigable by blind kayakers. To navigate a course that is constrained by directionality and obstacles, without the ability to see markers, a form of auditory feedback to direct the participants through the course was suggested. The device needed to be portable, wireless, water-resistant, and able to work in still or “gentle” waves. Lastly, the design needed to be simple to use. The technology with all of the buoys and equipment will need to fit into two regular car trunks to store the slalom system, with a maximum set-up time of an hour. Team River Runner intends to send the system via mail to other chapters. Therefore, a simple setup will need to be explained through provided documentation or oral communication. The team’s final design was comprised of ten buoys with speakers controlled manually by a control box on-shore. The operator will turn on a labeled switch that corresponds to its respective buoy which will play a preloaded song. This allows the participant to be guided to the buoy. 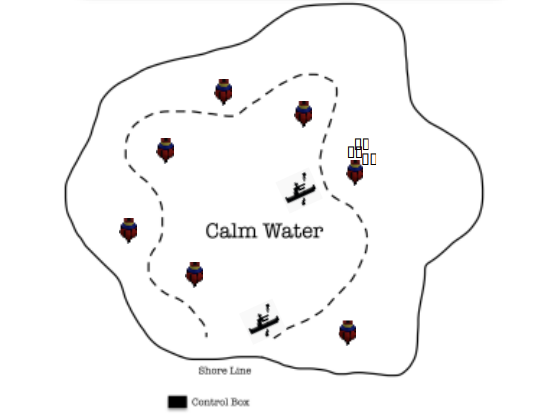 The participants will know whether they need to pass to the left or right of the buoy. As the participant passes the buoy, the switch is flipped off, and the music will stop. The next buoy will then be activated by the operator, and a different song will play, guiding them to the next buoy. Thank you, Team, for improving the quality of life of blind veterans, and helping Team River Runner offer its blind members the opportunity to kayak independently.